Our wide selection of padlocks for sale are suitable for commercial, residential and industrial use. 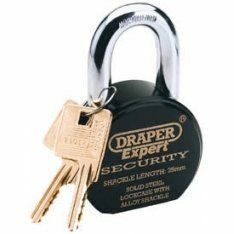 At Ironmongery Experts we stock weather proof padlocks, keyed padlocks, heavy-duty padlocks and combination padlocks. Our padlocks are rated from the level of security they provide. If you require professional advice regarding which padlock would suit your property better give our team a call on 01376 557 561. For additional security, we sell other high-security products, including hardened steel padlocks, drill-resistant padlocks, heavy-duty hasps and staples, hardened alloy steel chains and bolt-down anchors for floors and walls. Additionally we stock garage door locks for an extra level of secondary security. Our main brand for this range is the British-brand Bulldog Security, which provides door bolts for metal, glass fibre or wooden doors and high-security door locks for double doors, sliding doors, gates and storage containers. Additional security can be provided by having security cameras within the premises of your building or in outside of your home. We supply a surveillance kit which is equipped with two wireless outdoor cameras, motion detection with alarm, night vision functionality and a simple to use app that will give you access to the video recording. Among our wide range of exterior hardware and security products, we store a variety of door hinges, door latches and door bolts for sale. We have a selection of tee hinges in stock, which will aid the process of closing and opening gate doors. In case you require stronger hinges for your doors, we also supply heavy reversible hinges, including galvanised steel hinges and black heavy reversible hinges. Alternatively, we have available hook and band hinges for hanging gate doors in various sizes, shapes and materials, such as Galvanised Steel Cranked Hook and Band Hinge, Black Cranked Band & Hook, Stainless Steel Adjustable Hook & Band Hinges and Japanned Straight Hook and Band Hinge. At Ironmongery Experts, we also supply a selection of gate hinges and fastenings. Most of our hinge sets come complete with all the necessary hooks, screws and fittings for a quick and easy installation. Among these we stock Black Spring Fastener Set, Black Double Gate Fastener Set and Black Standard Hinge Set. Sprung hinges & coil gate springs are also in sure supply and are available in a variety of sizes and shapes, including black self-closing gate hinges, coil gate springs, decorative gate hinges, among others. These mechanisms aid closing and opening exterior doors. To ensure safety, exterior doors such as gate doors should be equipped with gate latches. Our most popular model is the MagnaLatch which has a magnetic system and with it prevents jamming or sticking. In addition to this, the MagnaLatch adapts to glass, metal or wooden gates and is easy to install. If you are looking for a more traditional gate latch model, we also stock elegant ring gate latches to keep doors securely fastened while keeping your décor on point. Gate bolts are also a good option when choosing which method to secure your exterior doors with. Ironmongery Experts have a wide range of efficient and easy to use door bolts, including foot operated bolts, spring chain bolts, galvanised steel garage door drop bolts, pad-bolts, lockable drop bolts, heavy-duty padlock bolts, among many others. To aid opening gate doors, we also stock galvanised hot bed handles, which come in sizes 150mm or 180mm. For garage doors to stay in the upright position for you to safely enter and exit the premises, garage door stays should be installed. Each product comes complete with a pull cord to help lift the garage door. In addition to our exterior hardware range, we also supply equestrian ironmongery for sale. If you are involved with equestrian we have a wide selection of product you might require, including bridle brackets, stable door latches, saddle poles, saddle racks, table hangers, among others. Finally, we stock hasp and staples in a variety of sizes and finishes, for example short steel heavy hasp and staples, zinc plated hasp and staples, stainless steel medium hasp and staples, as well as heavy-duty hasp and staples. These locking mechanisms will require a padlock to be secured.